If you want to go camping with your horse, the first thing you’ll need to do is find a campground. There are a lot of equestrian campgrounds across the country, but you’ll need to do some research to find the best one for you. First you’ll need to decide where you want to go, what amenities you need, and accessibility. Just finding equestrian campgrounds can be its own project. 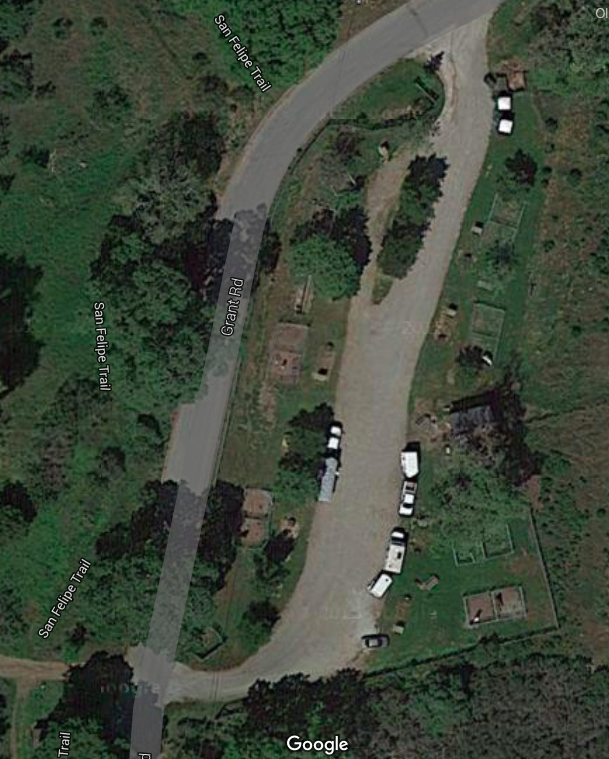 I have yet to find a definitive list of equestrian campgrounds; each collection has some overlap, but also some new finds. Even the aggregate sites are missing campgrounds. For example, we’ve previously horse camped at Joseph D Grant County Park. It’s an excellent horse campground with individual corrals at each site, a fenced pasture, ample trailer parking, and easy trail access and it’s not listed on any of the aggregate horse camping websites. I found it only because I was looking at all of the parks in my county. I’ve started my own spreadsheet tracking all of the campsites in my area. If you’re in Northern California, feel free to email me and I’ll share my list. That said, if you don’t feel like spending your time searching for obscure campgrounds, the following websites offer easy ways to find equestrian campgrounds. The next two sites aren’t horse specific, but you can do a search for Horse Sites. If you’re looking to go to a specific park or destination, you may want to try joining Horse Trails and Camping Across America (HTCAA). This Facebook ground has over 50,000 members. 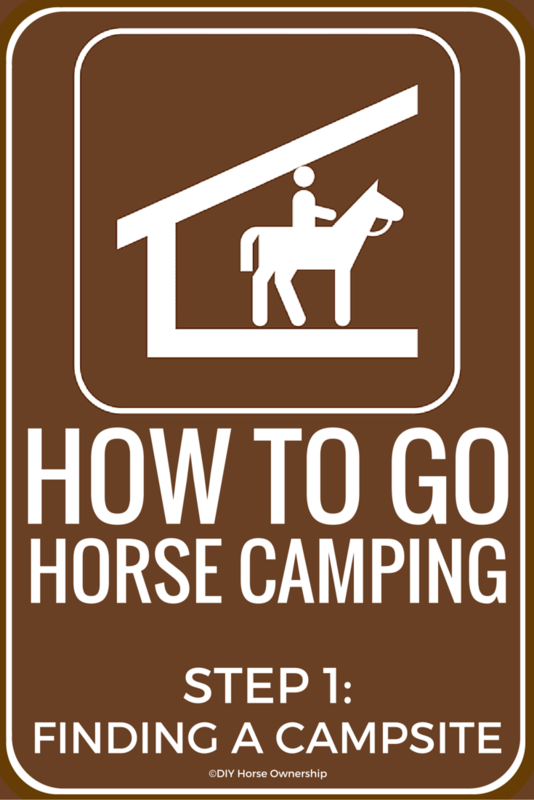 In addition to searching through previous posts, you can ask members if they know of horse campgrounds in a particular area. People may know of private or otherwise unlisted campgrounds. Now that you know where to search, you’ll need to consider what to search for. The amenities offered at equestrian campgrounds can vary wildly from primitive sites to sites with hookups for RVs and Living Quarters and even sites with cabins and stalls for rent (although at some point you’re no longer really camping). Some sites may have corrals, hitching posts, water troughs, and maybe even grazing space for your horse while others may be simply be a place to park. At some campsites you may even need to bring your own water. (You probably want to bring your own water no matter what, but I’ll cover that in my What to Pack post). While spots with corrals are easy, especially for beginner horse campers, it is possible to camp at sites that don’t have them. You can install HiTies onto your trailer, buy a highline, buy portable corrals, or use a portable electric fence. I’ll get into these options more in another post, but wanted to mention them here so that you don’t automatically rule out sites without corrals. Unfortunately, there’s no easy way to search for amenities. You’ll need to look at the details for each site your search returns and determine if it meets your needs. The vast majority of equestrian campgrounds are primitive so the more you can provide for yourself, the more options you’ll have. While not technically an amenity, you do want to look into how much shade a camping spot offers. In the summer, having a camping spot or corrals without any shade can be miserable for you and your horses. You may be able to find pictures of the campground online, but be careful; every site can be different. Just because site #7 has shade doesn’t mean site #8 does. I like to look at satellite images of the campground to determine shade availability. 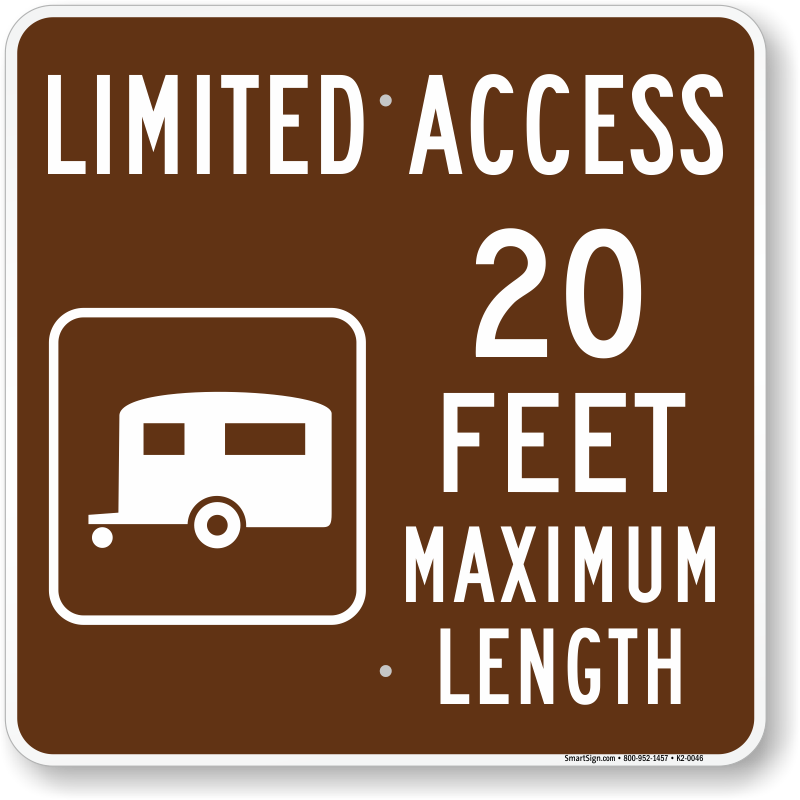 There are two accessibility issues to consider when searching for an equestrian campground: 1) How easy is it to get to the campground and 2) How easy is it to get to horse trails from the campground. Some horse campgrounds can be hard to get to. 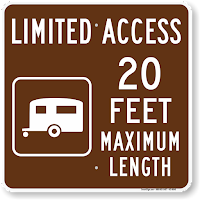 For example, the driving directions to Juniper Lake Corral in Lassen Volcanic National Park include this line “The last 6 miles is rough dirt road not suitable for buses, motor homes, or trailers.” This is a campground designed for horses, with corrals and trailer parking. It’s easily searchable and will come up in all of the above-mentioned horse camping search engines. And yet it’s going to be very difficult to get to without a good 4-wheel drive truck and a higher clearance trailer. Some parks will even tell you that you must have 4 wheel drive or that only trailers under a certain length are allowed. Make sure you research this before you book a site. You may want to call the park’s rangers and ask about driving in with a horse trailer. You might think that an equestrian campground would have riding trails – and I’d argue you’d be thinking correctly – but this isn’t always the case. 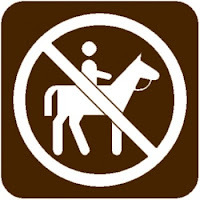 Some equestrian campgrounds are in or near parks that have trails, but may not have direct access from the campground. You might need to load up and drive to a trailhead. While inconvenient, it might be worth it. One of my favorite trail rides while camping was to the Giant Redwoods in Yosemite. We camped too far from Mariposa Grove to ride there directly, but we drove to the trail head one day and it was well worth it. Check park maps – which are often available online – to see what you can ride to directly from your camp site. 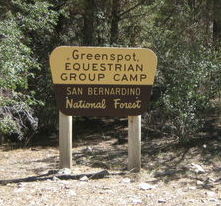 A lot of equestrian campgrounds are group sites. 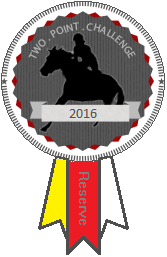 While some parks will have individual equestrian sites and group equestrian sites, some parks will only have group equestrian sites. This can be a good or a bad thing depending on what you want to do. If you want to go camping with a group of riding friends or family, it’s great. If you just want to go with your spouse or one other friend, it can be a problem. Some group campgrounds simply cost more than an individual site. If you don’t mind spending the extra money, go ahead and book the site. However, some group sites have a minimum number of people. If the park doesn’t offer any individual equestrian campgrounds, you can try calling the park to ask about renting the site without meeting the minimum. However, the park may or may not allow this. Summer is coming; start planning your horse camping trip now. If you’re going anywhere this year, tell me about it. Great information! i see that there's a campground in Maine – which would be a long haul with a horse! Have you camped at Plasse's resort (Silverlake – http://www.plassesresort.com/), up on 88? I used to go horse camping there with friends. The hiking is fabulous, too. My Lab swam in six different lakes during one day hike. Heading up to Groom Creek in Prescott, just a couple hours north of Phoenix, next month. As soon as April/May hits and the temperatures rise, it becomes our summer quest to find cooler weather as often as we can. Try the fb group. I've seen people post about horse camping in Canada. We head to the mountains for the cool air too. I'll have to look into it. Thanks! Thank you so much for this series! I really want to go camping with Rico before he gets too old. I've camped a lot myself, but never with a horse so I have no idea even where to start. This will be really helpful! I'm glad it's helpful. Once you're in my area, I'd highly recommend Grant County park for horse camping. If you want to drive, Yosemite is my favorite park and the horse campgrounds are nice. There are 3 state parks in Oklahoma that offer equestrian camping- I've been thinking about getting a group together to go, so I'm really looking forward to reading this series of posts! I hope you do; it's so much fun.